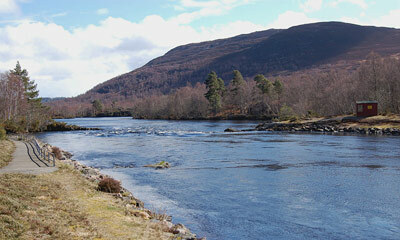 The Upper Conon Fishings are owned by Loch Achonachie Angling Club and extend from below Loch Luichart Power Station for approximately 2.6 miles (4 km) to Loch Achonachie. The fishing is double banked and split into 4 beats - Beat 1 North bank and South bank are directly above Loch Achonachie and Beat 2 (North and South) lies above that. There are 3 anglers allowed at any time on each of the 4 beats. Fly Fishing is permitted at all times and spinning is allowed when Loch Luichart Power Station is generating electricity. 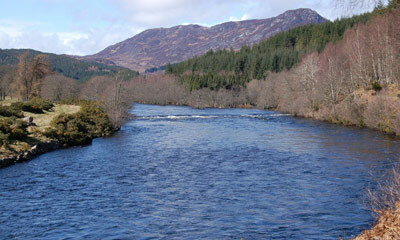 The volume of water flowing into the Upper Conon river is largely dependent on the operational requirements of Scottish and Southern Electricity plc and no guarantee of redress can be given in this respect by the Club or by Scottish and Southern Electricity plc. The fluctuations in water levels are considerable, sudden, and no prior warning is given. The Upper Conon is generally a summer beat with August being the most productive month. Recent salmon & grilse catches for the Upper Conon beats are 12 in 2007, 24 in 2008, 16 in 2009, 18 in 2010 and 13 in 2011, producing a 5-year average of 17 fish. 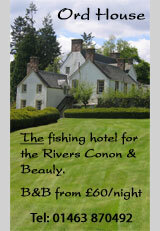 Despite the modest catches this is a lovely beat to fish in stunning scenery and well worth a visit.